See more objects with the tag architects, architecture, interior, decoration, figures, bridges, pavilion, designers, decorative, print collectors, printmakers, furniture makers, bells. See more objects with the color darkgrey grey darkkhaki rosybrown brown or see all the colors for this object. 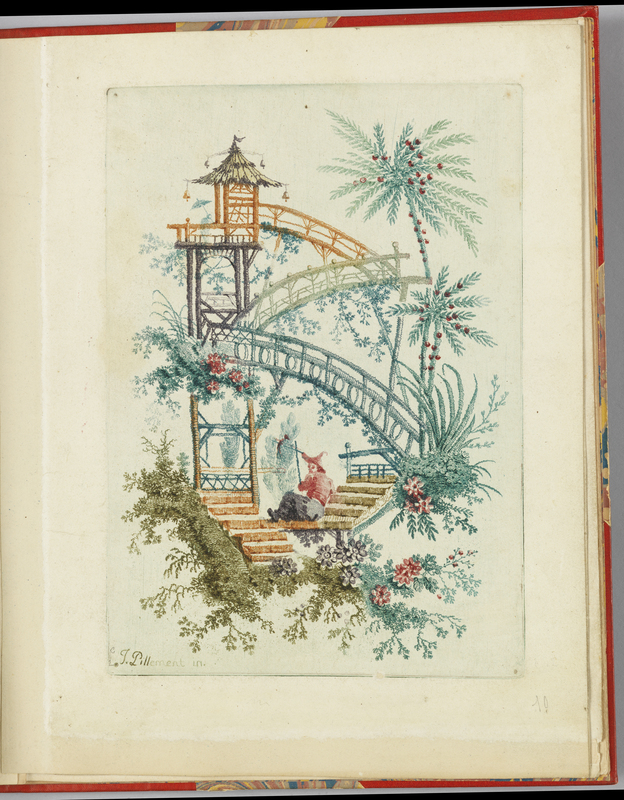 This and 17 other objects are a part of a set whose first object is Album, Title page, Plate 1 from "Nouvelle suite de cahiers arabesques chinois a l'usage des dessinateurs et des peintres", No.1, Inventes et dessines par Jean Pillement. Graves par Anne Allen.. This is a Print. It was designed by Jean-Baptiste Pillement and etched by Anne Allen. We acquired it in 1921. Its medium is etching à la poupée on off-white laid paper. It is a part of the Drawings, Prints, and Graphic Design department.